On the declaration of war between the United Kingdom, France, and Germany in September 1939, the Belgian government launched a crash re-armament program, augmenting the national defenses by creating the K-W Line linking the National Redoubt at Antwerp with the south along the River Dijle, just behind the main Fortified Position of Liège. The military held out against German forces for 18 days, against overwhelming odds. On 28 May, forced into a small pocket along the Leie river and after failed attempts to broker a ceasefire on the 27th, the Belgian king and military surrendered unconditionally. 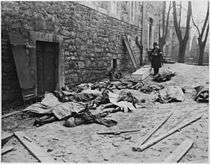 Belgian casualties during the campaign numbered some 6,000 killed and 15,850 wounded. 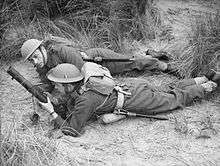 Some 112,500 French and Belgian troops escaped to the UK via Dunkirk but the majority of the Belgian survivors were made prisoners of war and many were not released until the end of the war. The resistance were instrumental in saving Jews and Roma from deportation to death camps, for instance the attack on the "Twentieth convoy" to Auschwitz. 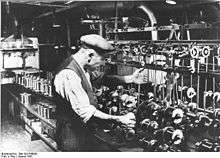 Many Belgians also hid Jews and political dissidents during the occupation, with one estimate putting the number at some 20,000 people hidden during the war. [note 2] There was also significant low-level resistance, for instance in June 1941, the City Council of Brussels refused to distribute Stars of David badges. Certain high-profile members of the Belgian establishment, including Queen Elizabeth and Cardinal van Roey, Archbishop of Malines, spoke out against the German treatment of Jews. So far, 1,612 Belgians have been awarded the distinction of "Righteous Among the Nations" by the State of Israel for risking their lives to save Jews from persecution during the occupation. ↑ For a map of all World War II memorials in Brussels, see "Brussels Remembers". Retrieved 28 May 2013. 1 2 3 "Belgium after World War II". Encyclopædia Britannica. 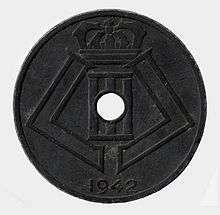 1 2 "Belgium 1929–1940 – Economic Policy". World History at KMLA. Retrieved 31 December 2012. ↑ Schuermans, Willy (2006). Memo 6: Nieuwste Tijden, 20ste – 21ste eeuw. Antwerp: de Boeck. pp. 42–47. ISBN 978-90-455-1501-4. ↑ "Belgium 1929–1940 – Domestic Policy". World History at KMLA. Retrieved 31 December 2012. ↑ di Muro, Giovanni F. (2005). Léon Degrelle et l'aventure rexiste. Brussels: Éd. Luc Pire. pp. 151–3. ISBN 2-87415-519-5. 1 2 "Belgium 1929–1940 – Foreign Policy". World History at KMLA. Retrieved 31 December 2012. ↑ Balace, Francis (10 May 1990). "L'Armée Belge à l'Aube du Conflit: Nous Avions une Armée de Reservists, Un Belge sur Douze était Mobilisé". Le Soir. Retrieved 15 May 2013. ↑ Thomas, Nigel (1991). Foreign Volunteers of the Allied Forces: 1939–45. London: Osprey. p. 15. ISBN 978-1-85532-136-6. ↑ Various authors (1941). Belgium: The Official Account of What Happened, 1939–40. London: Belgian Ministry of Foreign Affairs. p. 99. 1 2 3 Mollo, Andrew (2001). The Armed Forces of World War II: Uniforms, Insignia & Organisation. Leicester: Silverdale Books. pp. 48–50. ISBN 1-85605-603-1. ↑ "The Campaign of the Belgian army in May 1940". home.scarlet.be/vdmeiren. Retrieved 17 January 2013. 1 2 "Belgium, Army". ABC-CLIO. Retrieved 17 January 2013. 1 2 3 "Les prisonniers de guerre belges". Retrieved 17 January 2013. 1 2 3 4 5 Langworth, Richard M. "Feeding the Crocodile: Was Leopold Guilty?". Churchill Centre. Retrieved 17 January 2013. ↑ Schloss, Andrew (Summer 2004). "Obituary for the Belgian Franc: Belgium's Post-War Political Landscape Reflected Through its Coinage". ANS Magazine. 3 (2). Archived from the original on 14 August 2012. Retrieved 18 January 2013. 1 2 "Leopold III". Encyclopædia Britannica. 2009. 1 2 "April 5, 1943: Belgium tragedy in USAAF daylight bombing raid". Ww2today.com. Retrieved 15 April 2013. ↑ ""Stop Bombing Us": Primate's appeal to Allies reported on Belgian Radio". Catholic Herald. 26 May 1944. Retrieved 15 April 2013. 1 2 Witte, Els; Craeybeckx, Jan; Meynen, Alain (2010). Political History of Belgium: From 1830 Onwards. Asp. pp. 203–4. ISBN 978-90-5487-517-8. 1 2 3 "La Belgique docile" report summarised in Baes, Ruben. "'La Belgique docile': Les autorités belges et la persécution des Juifs". CEGES-SOMA. Retrieved 18 January 2013. ↑ Estes, Kenneth W. (2007). A European Anabasis: Western European Volunteers in the German Army and SS, 1940–1945. Columbia: Project Gutenburg. ISBN 0-231-13030-9. ↑ Nash, Douglas E. (2009). Hell's Gate: the Battle of the Cherkassy Pocket, January–February 1944 (3rd ed.). Stamford, CT: RZM Imports. p. 27. ISBN 0-9657584-3-5. 1 2 3 4 Waterfield, Bruno (17 May 2011). "Nazi hunters call on Belgium's justice minister to be sacked". The Telegraph. Retrieved 26 February 2013. 1 2 3 Conway, Martin. The Sorrows of Belgium: Liberation and Political Reconstruction, 1944–1947. Oxford: Oxford University Press. pp. 21–23. ISBN 978-0-19-969434-1. 1 2 Moore, Bob (ed.) (2000). Resistance in Western Europe (1st ed.). Oxford: Berg. p. 35. ISBN 1-85973-274-7. 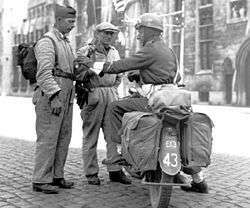 ↑ "A Brief History of Belgian Resistance". Groupe G - WWII Living History. Retrieved 26 December 2012. ↑ "Museum van Deportatie en Verzet". Retrieved 3 November 2012. ↑ Saerens, Lieven (1998). "The Attitudes of the Belgian Roman Catholic Clergy towards Jews prior to the Occupation". In Michman, Dan. Belgium and the Holocaust: Jews, Belgians, Germans (2nd ed.). Jerusalem: Yad Vashem. p. 156. ISBN 965-308-068-7. 1 2 3 4 5 6 7 8 "Belgium". European Holocaust Research Infrastructure Project. enhri-project.eu. Archived from the original on 21 September 2013. Retrieved 4 April 2013. ↑ "Breendonk, Le Mémorial ne changera pas de nom". Le Soir. 6 December 2007. Retrieved 26 February 2013. ↑ Van der Wilt, Olivier. "Europäische Perspektiven der Gedenkstättenpädagogik". Retrieved 3 November 2012. ↑ Van der Wilt, Olivier. 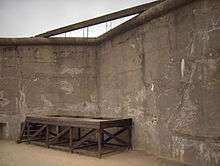 Le projet pédagogique du Mémorial National du Fort de Breendonk. p. 1. ↑ Jacquemyns, Guillaume; Struye, Paul (2002). 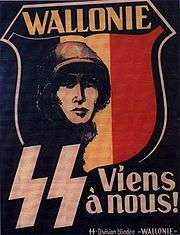 La Belgique sous l'occupation allemande: 1940–1944. Brussels: Éd. Complexe. p. 113. ISBN 2-87027-940-X. ↑ Baete, Hubert (ed.) (1994). Belgian Forces in United Kingdom. Ostend: Defence. p. 87. ↑ Baete, Hubert (ed.) (1994). Belgian Forces in United Kingdom. Ostend: Defence. pp. 147–51. 1 2 Thomas, Nigel (1991). Foreign Volunteers of the Allied Forces: 1939–45. London: Osprey. p. 17. ISBN 978-1-85532-136-6. 1 2 3 Killingray, David (2012). 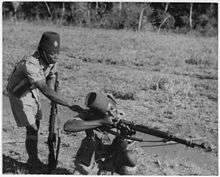 Fighting for Britain: African Soldiers in the Second World War. London: James Currey Ltd. p. 7. ISBN 1-84701-047-4. ↑ Dowling, Timothy C. (ed.) (2005). Personal Perspectives: World War II. 2. Oxford: ABC-CLIO. p. 149. ISBN 1-85109-575-6. ↑ Wickman, Stephen B. (ed.) (1985). Belgium A Country Study. U.S. Government Printing Office. p. 45. ISBN 0-16-001635-5. 1 2 3 "1944: The liberation of Brussels". Brussels.be. ↑ Fadoul, Karim (13 June 2007). "De van Acker à Verhofstadt". La Dernière Heure. Retrieved 25 June 2013. ↑ Thomas, Nigel (1991). Foreign Volunteers of the Allied Forces: 1939–45. London: Osprey. p. 16. ISBN 978-1-85532-136-6. ↑ Burgaff, Eric (16 December 2004). "Les Belges à la libération". Le Soir. Retrieved 18 February 2013. ↑ "Belgian Armed Forces in the United Kingdom – Introduction". Be4046.eu. Retrieved 13 April 2013. ↑ Cole, Hugh M. (1965). The Ardennes: Battle of the Bulge. Washington D.C.: Government Printing Office. p. 56. 1 2 "Battle of the Bulge: December 16, 1944 – January 28, 1945". History Channel. Retrieved 12 May 2013. 1 2 "V-Bomb Damage in Belgium Extensive". Canberra Times. 17 May 1945. Retrieved 15 April 2013. ↑ "Léon Degrelle". Encyclopædia Britannica Online Edition. 2007. 1 2 Belga (30 December 2005). "La fin des forces belges en Allemagne: Soixante ans d'histoire" (PDF). Le Soir. Retrieved 25 June 2013. ↑ Dorzée, Hugues (3 April 2013). "Nos vétérans congolais spoliés et oubliés de l'histoire". Le Soir. Retrieved 1 July 2014. ↑ "Lisolo Na Bisu". Klm-mra.be. Retrieved 15 December 2012. ↑ "De Force Publique van Belgisch Kongo in de periode 1940–1945". VOX. Defence. Retrieved 15 December 2012. Various authors (1942). The Belgian Congo at War. New York: Belgian Information Center. Weller, George (1941). The Belgian Campaign in Ethiopia: A Trek of 2,500 Miles through Jungle Swamps and Desert Wastes. New York: Belgian Information Center. Bernard, Henri (1968). La Résistance 1940–1945 (in French). Brussels: Éd. Renaissance du livre. Conway, Martin (1993). Collaboration in Belgium: Léon Degrelle and the Rexist Movement, 1940–1944. New Haven: Yale Univ. Press. ISBN 0-300-05500-5. Conway, Martin (2012). The Sorrows of Belgium: Liberation and Political Reconstruction, 1944–1947. Oxford: Oxford University Press. ISBN 0-19-969434-6. Conway, Martin; Gotovitch, José, eds. (2001). Europe in Exile: European exile communities in Britain 1940-1945 (1st ed.). New York: Berghahn. ISBN 978-1571817594. Keyes, Roger (1984). Outrageous Fortune: The Tragedy of Leopold III of the Belgians, 1901-1941 (1st British ed.). London: Secker & Warburg. ISBN 978-0436233203. Houbion, Georgette; Marichal, Jean-Louis. "History of the Piron Brigade 1940–1945". Brigade-piron.be. Retrieved 7 March 2013. 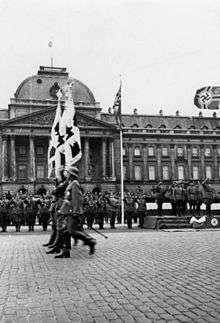 "Holocaust Encyclopedia: Belgium". United States Holocaust Memorial Museum. Retrieved 5 May 2013. "The Belgian War Press". CEGES-SOMA. Retrieved 7 March 2013. Van Wijnsberghe, Jean-Marie. "The Belgian Armed Forces, 1940–1946". Be4046.eu. Retrieved 30 May 2013.